The present analysis examines the Spanish and English of adolescent bilinguals (L1 Spanish, L2 English) from an exclusively Hispanic neighborhood in Raleigh, North Carolina. 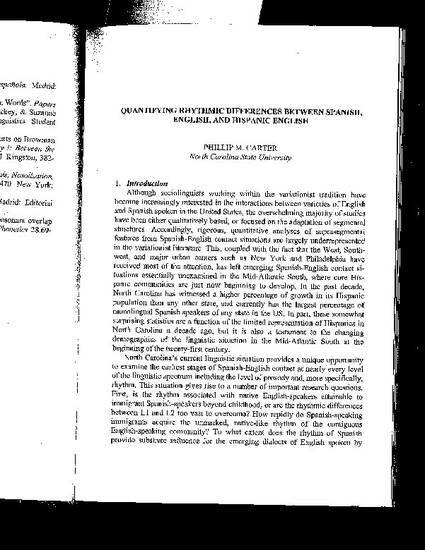 Conversational speech was analyzed for prosodic rhythm using the Pairwise Variability Index (Low & Grabe 1995), which included for each speaker at least 200 syllable-to- syllable comparisons in each language in order to determine the actual quantitative differences between Spanish and English. Additionally, the English data were compared to the data in the Thomas and Carter (2003 a, b) corpus in order to determine the rhythmic differences between North Carolina Hispanics and the benchmark non-Spanish-speaking, native English-speaking community. Finally, the Raleigh corpus provides access to monolingual Spanish speakers whose data will be used to examine the differences in Spanish among monolingual and bilingual Spanish speakers, shedding light on possible influences of English on the Spanish of Raleigh bilinguals. As expected, initial findings show that the rhythm associated with Hispanic English is, in fact substantially more syllable-timed than the English of non-Hispanics, while the rhythm associated with the Spanish of the Raleigh bilinguals is significantly more syllable-timed than the English of either group. Differences, however, are gradient, and there is considerable inter-speaker variability among speakers within these communities.